We eat A LOT of asparagus. I see it on sale, buy an armful, steam it lightly, then use it to fill out other things–steel-cut oats and an egg, lunch salad with cannelloni beans, a way to gussy up a croque monsieur so I don’t feel like Lonely Guy eating grilled cheese in an empty house. 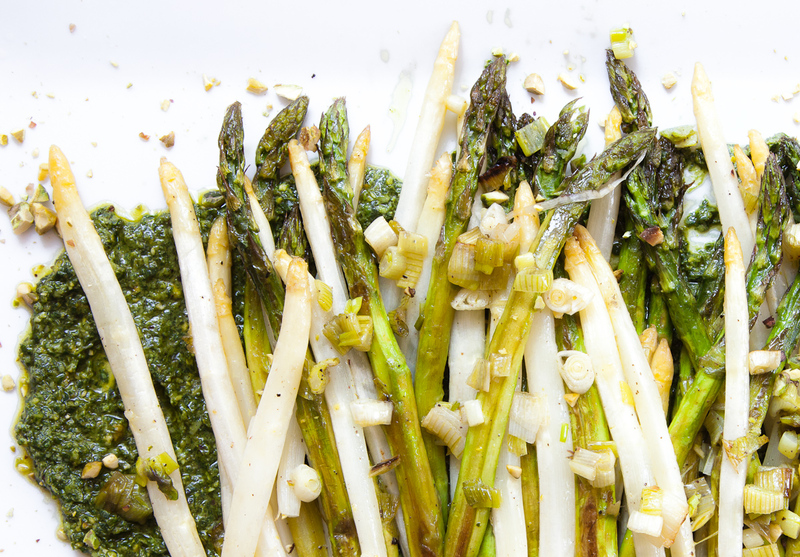 But Roasted Asparagus with Pistachio Pesto is something else altogether. You set this platter in front of friends who aren’t afraid of getting a little messy when everyone’s standing around in the kitchen with a beer (my preference with asparagus, by the way)* or glass of wine, carrying on while you cook. Serious finger food. Many years ago I happened to be waiting on Julia Child, who was eating with friends at Maison Robert, an éminence grise among French restaurants in Boston, with tables swathed in surgical white and battalions of staff on hand to dissect your duck or Dover Sole table-side. Julia ordered asparagus with a light vinaigrette as an appetizer and the rest of the table followed suit. When the appetizers arrived everyone picked up their knives and forks and went to work. Ignoring the appetizer service, she selected a green stalk with her naked fingers, swished its tip in vinaigrette and then merrily consumed it in two quick bites. Three forks froze in mid-air. “Don’t you love asparagus!” she cried, oblivious to the exchange of glances. One by one her dining companions set their silverware down. A bit of squeamish pincering and dipping followed, while Julia, now one stalk in the lead, forged ahead. A minute later everyone was laughing and carrying on, talking about how great spring asparagus is. That’s how you eat this dish. Keep a roll of paper towels nearby and don’t invite anyone who won’t use their fingers–or share. *Come to think of it, we don’t invite anyone to dinner at our house unless they’re comfortable hanging out in the kitchen. Go for the fattest asparagus you can find. 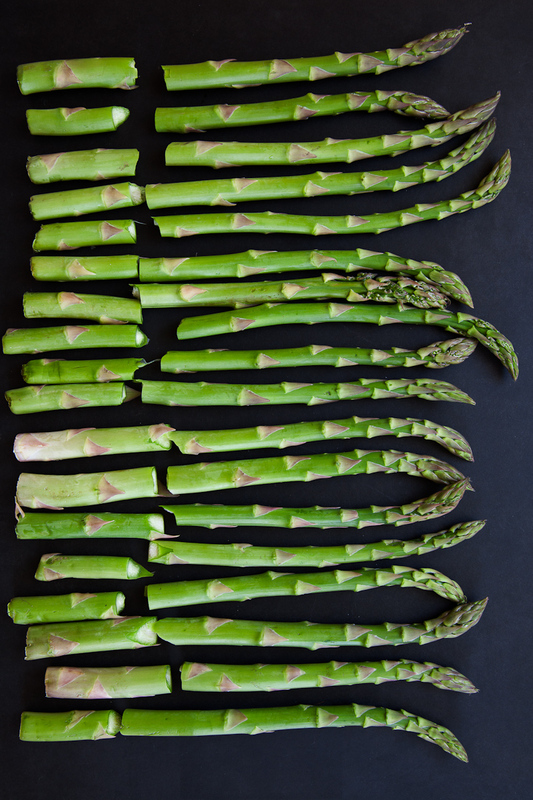 If the asparagus are fat, snap off the fibrous portion off the root end of the stems. Peel the the stem. If the asparagus are pencil thin, snap the ends but don’t bother with the peeling. If they’re somewhere in between, it’s up to you–I do peel the medium ones. 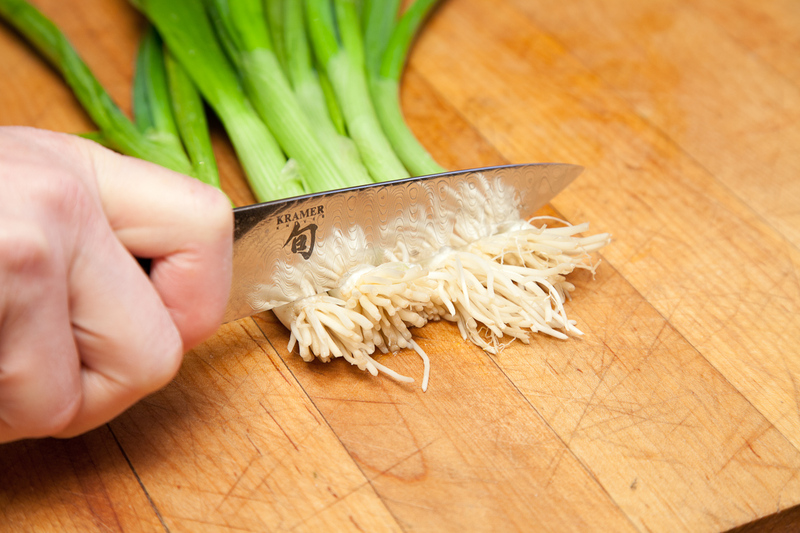 Trim the roots and gnarly green ends off the scallions. Slice the white sections into ½-inch rounds. Save the greens. Reserve 1 bunch of the greens for pesto and the second bunch for another use. 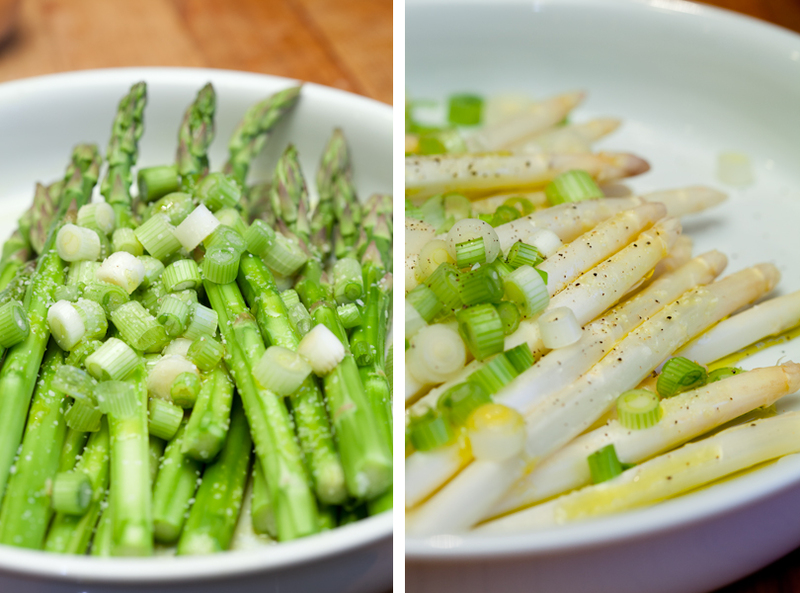 If you’re using white and green asparagus, treat them separately in the next steps. Depending on their sizes, one will probably cook faster than the other. Toss the vegetables with 3 tablespoons extra virgin olive oil and season with salt and pepper. Arrange on sheet pans in a single layer and put on a rack in the middle of the oven. (Ignore the parchment paper on the sheet pans in the photographs. We tried it and found the asparagus doesn’t brown as well.) Roast until golden brown and tender, 8-10 minutes. To serve, smear a generous portion of the pesto over the bottom of a platter. Lay the asparagus on top. Drizzle with lemon juice and additional olive oil if they seem dry. Sprinkle with the remaining pistachios. Serve extra pesto on the side. Bring a large pot of salted water to a boil. 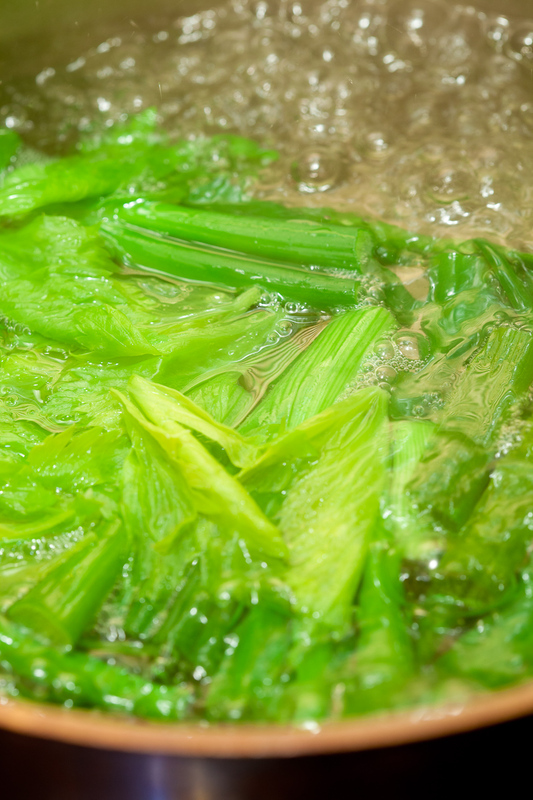 Add the scallion greens and celery leaves and cook 3 minutes. Scoop out and dump into a bowl of ice water. Drain and squeeze dry. Put the greens and basil into a food processor and, with the motor running, add the oil in a thin steady stream and process until the leaves are finely chopped, about 1 minute. Add the garlic, all but a tablespoon of the nuts, and lemon zest and process for another 20 seconds or until the nuts are finely chopped, but not a paste. Transfer the pesto to a bowl. Stir in the cheese. Taste and adjust seasoning. Asparagus say spring. 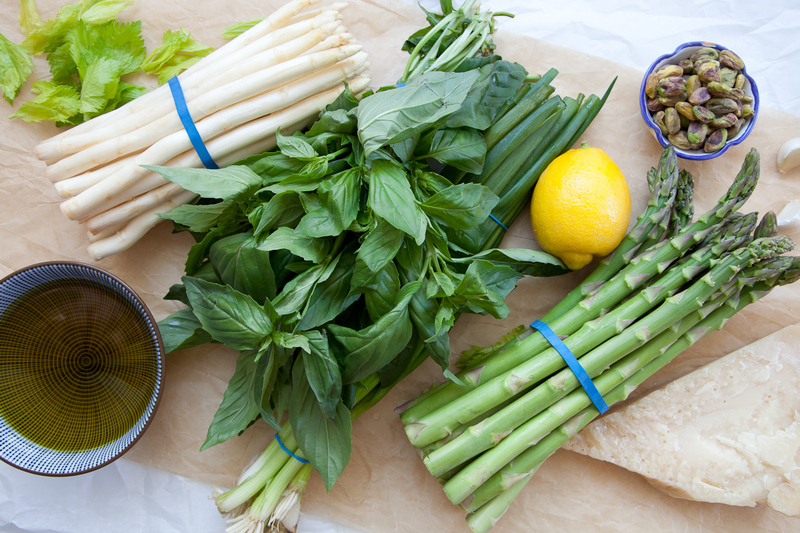 When we drove to Philadelphia each year to see my grandparents in April, we knew at least one meal would include a big platter of steamed fat asparagus from the farmer’s market rolled in lemon brown butter. Such simple ingredients, such complex flavors. 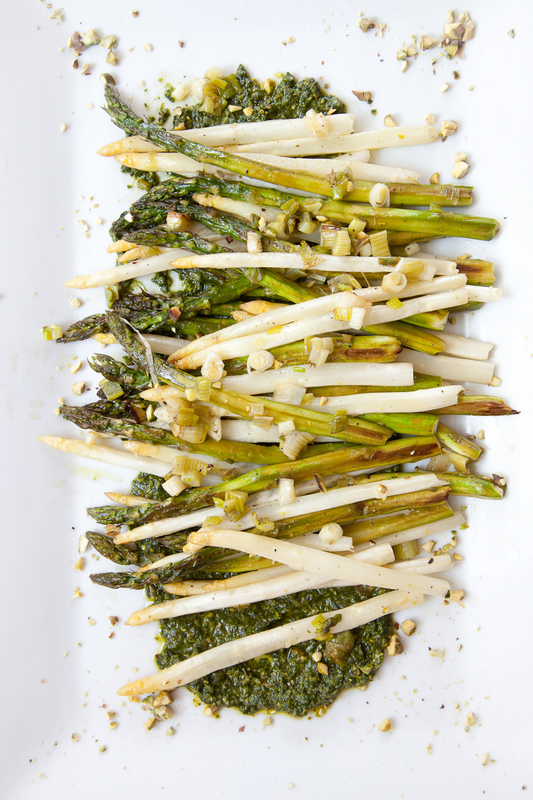 The grassy bitterness of the asparagus and the rich nutty flavor of the brown butter balanced by the acid of the lemon In this recipe, I am, as my grandmother would say, “gilding the lily” with pesto, but it goes so well with the asparagus and it’s a great way to wow guests. 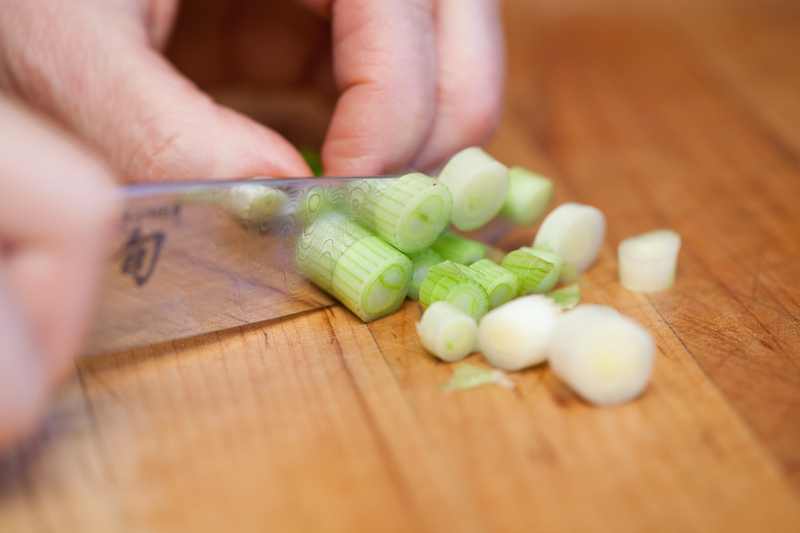 To snap or to cut; to peel or not to peel… I snap and I peel. Asparagus do not have an obvious clear and consistent line between the tough and tender part of the stalks so I’ve always snapped rather than use a knife. 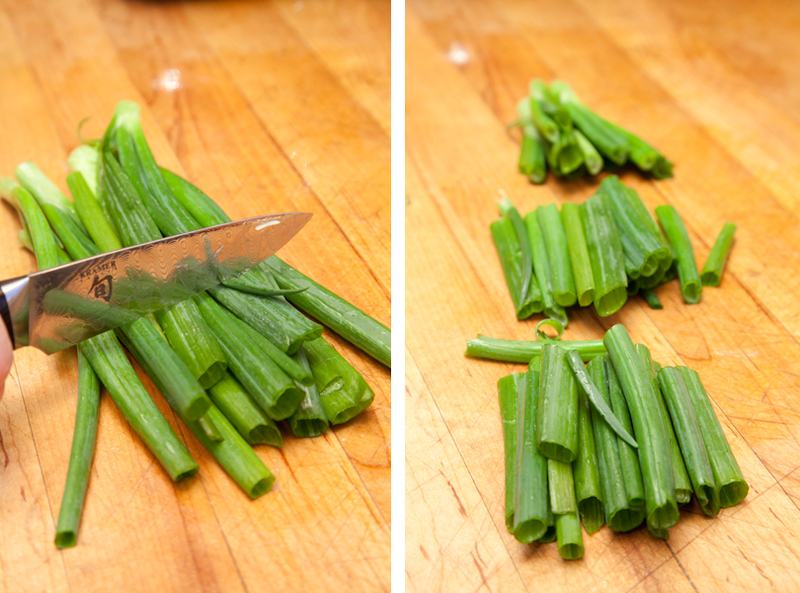 However, if you get a bunch of eerily consistent asparagus, go ahead and take a knife to whack off the ends. I like peeled asparagus. If you’re steaming or blanching big asparagus, it’s nice to peel to get rid of the fibrous outer layer, but if you’re going to grill those same asparagus, the outer layer helps protect the inner layer. When it comes to white asparagus, I always peel. By the time that fibrous outer layer of white asparagus is tender, the inner layer is mushy. 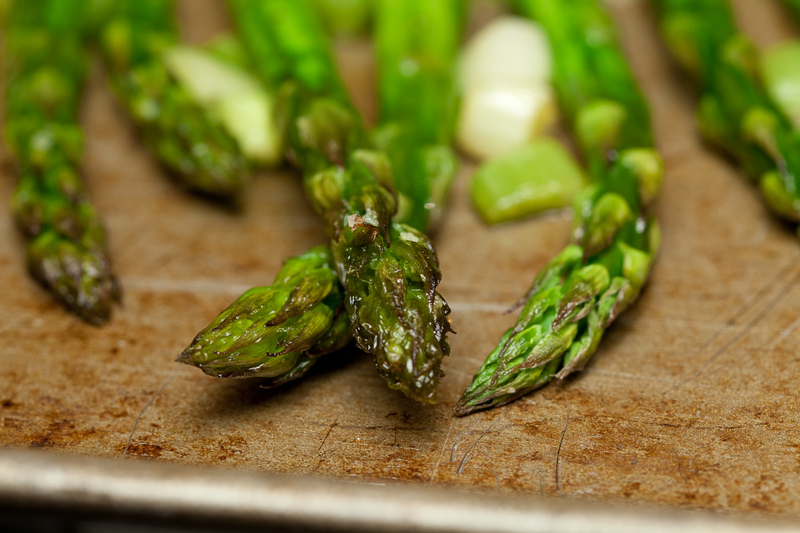 Peeling is also a way of prepping asparagus to eat it raw. 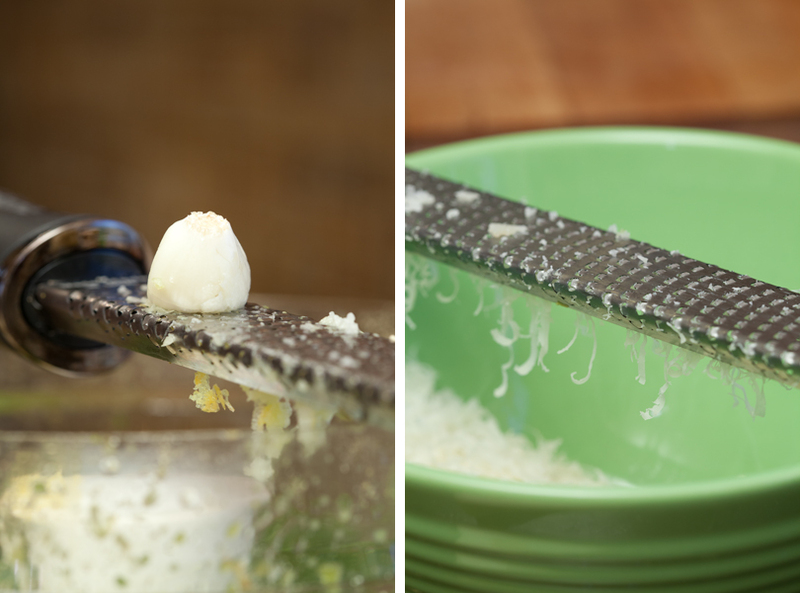 Using a peeler, slice the stalks into long thin ribbons, then toss with vinaigrette. 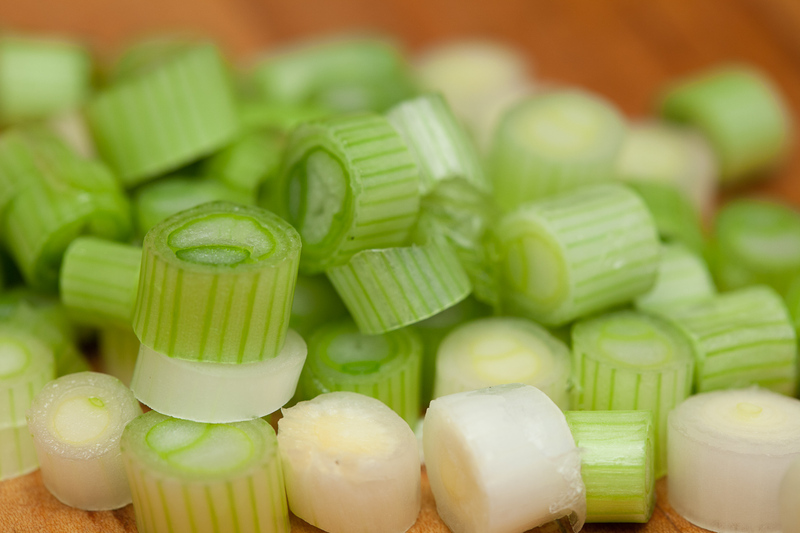 People fall into two camps when it comes to scallions–those who prefer the green part and those who prefer the white. Invariably the undesirable part gets thrown away. Don’t do that–use both parts. 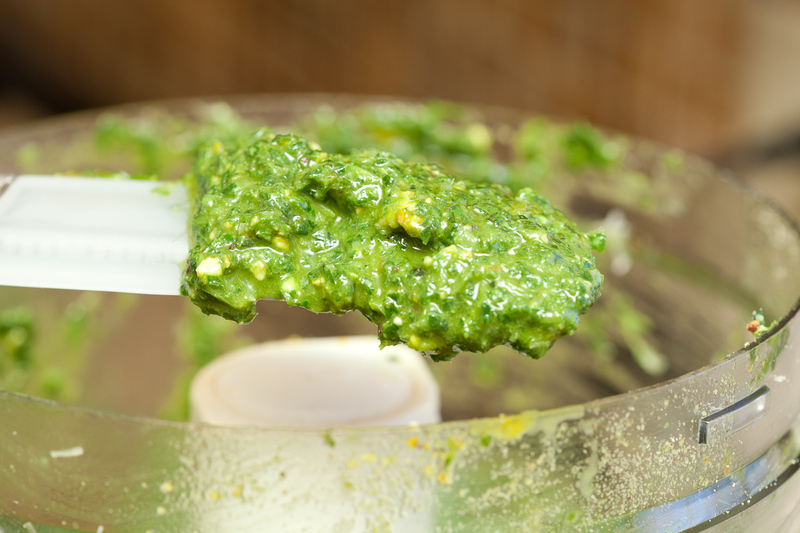 In the pesto recipe the greens are used like an herb and become part of the body of the pesto. I also include celery leaves, something else that is often discarded. Celery leaves are yummy and should be used more. Think of them as a green or an herb. If you don’t have any, don’t worry, just skip them. A note on pesto: Basil starts to oxidize and darken quickly once it’s chopped and exposed to air (note the difference in color in the photos of the pesto on the spatula and the pesto spread on the platter). If you put pesto in a bowl immediately after making it and cover it with a thin layer of olive oil it will remain bright. In my restaurants, we blanch the basil before making pesto (blanched basil doesn’t darken quickly). At home I usually don’t bother–the flavor is unaffected–but if you want durable brilliant green pesto, blanch the basil first. This entry was posted in Appetizer, Easy, fast, Gluten-free, Vegetarian and tagged asparagus, basil, evoo, Parmesan, pistachios, roasted. Bookmark the permalink. This is going on our Easter menu for sure. And if the weather holds out in the Boston area, I’ll grill the asparagus. I will carefully stab the stalks through the middle (if they’re wide enough) until I’ve created a “raft” of stalks. Then they are easy to flip and manage on the grill. Love the Julia story — can’t get enough. OMG this looks so yummy. That Julia story is so great. 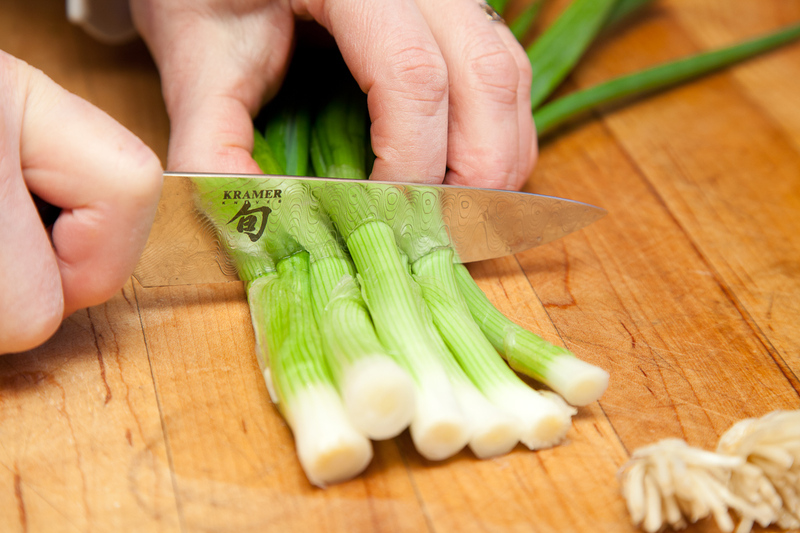 The tips to peel or not to peel and what do do with the scallions are noteworthy! I like the snacking in the kitchen idea too. At home it’s usually all work and no eating until the grand finale dinner. Merci. I have a feeling that snapping asparagus might be almost as much fun as Jody’s method for separating kale leaves from the stalks. A few years back the professor in my history of food class said that Miss Manners and all arbiters of etiquette declared eating asparagus with one’s fingers to be the most appropriate method of dealing with the green stalks. My dining companions never believe me when I tell them that, but now I have your Julia Child story to back me up as even more proof. Great recipe Ken; I’ve made the asparagus recipe in your cookbook (gouda cheese, truffle oil) more times than I can count, this will be a nice change. 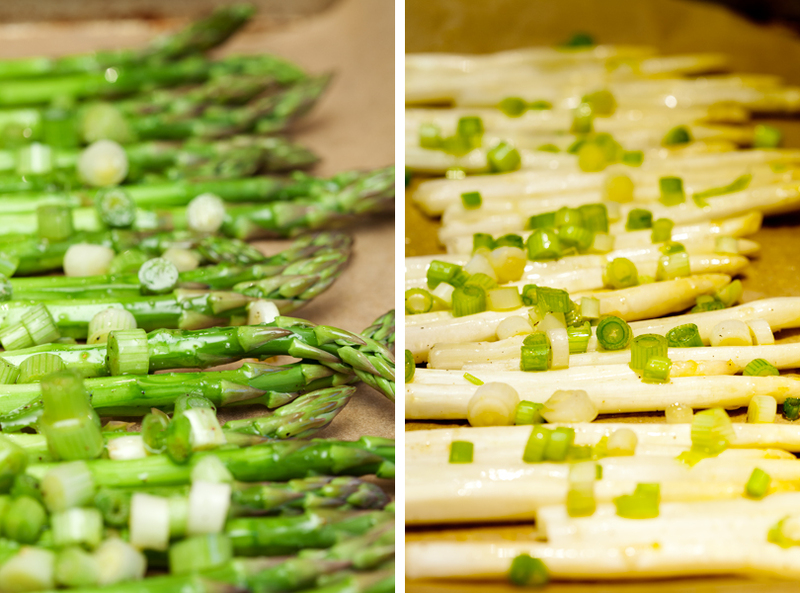 Where do you get the white asparagus, and where does it come from? I’ve been dying to try the white asparagus from Bassano, and will finally get my chance on our next Italy trip, next week. So little is produced that it is not exported anywhere. 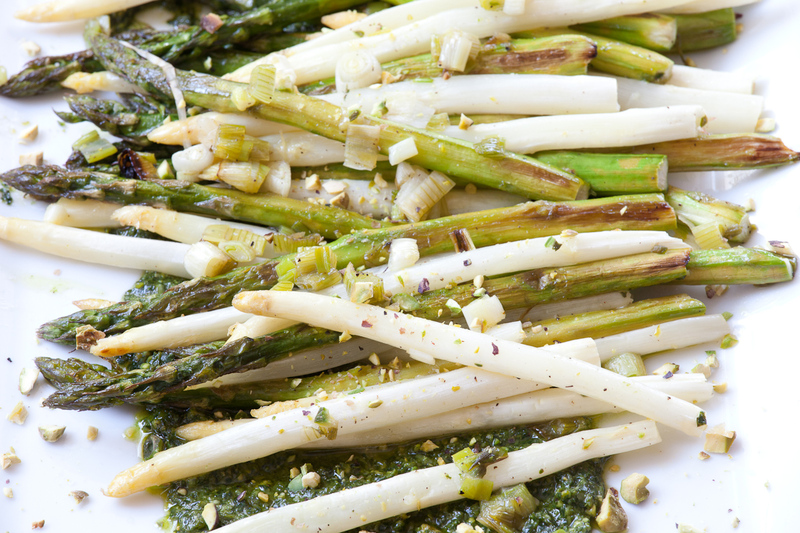 Oh thank goodness it’s Spring and asparagus season is finally here! I can’t wait to give this recipe a try. P.S. I wondered how you were going to do a quick cassoulet, then saw the duck confit in the list of ingredients. We’ve always made our own (that’s why God invented slow-cookers)–I don’t think I’ve ever seen it available for commercial purposes. Nice thing to know you can get it. Just stopping by to say hello! I am absolutely loving your photography – the colors, the plating, the composition – everything! Of course, the food looks delicious as well. It was great meeting you in Napa Valley. We plan on stopping by the bar at Rialto pretty soon. Hope to see you there! I wish I had seen this before my grocery store run this week! I noticed the asparagus was starting to appear. No matter, there will be plenty more. I am looking forward to trying this pesto; I have subbed walnuts for pine nuts (given their price) and pistachios seem like a great twist too. I really don’t use them as much as I should. And, I always enjoy a good Julia Child story! I’ve subbed walnuts for pine nuts too, which I happen to like, but their flavor is much more assertive. Pistachios are somewhere in between–you know you’re not eating pine nuts, but can’t quite figure it out. That was actually my sister who lives in Portland–I don’t know if it’s available on the East Coast yet. That does remind me I have found Bonnie’s jams at my local WFM and it’s delicious, I love the lime rickey flavor! Pistachio-basil pesto is a revelation! Pistachios are my absolute favorite, and this is a lovely way of incorporating them into a meal.